Bad Drip Don't Care Bear Iced Out E-Liquid is an awesome candied fruit blend of Gummy Guts with Peaches, Pears and a refreshing menthol twist. The inhale is an iced mixture of Gummy Candy with Candied Peach and Pear goodness while the exhale leaves you with a delectable sweet and tart blend that gets fresher and fruitier with every vape. A mouth-watering Candied Fruit Vapor you'll crave all day. This top selling premium E-liquid is masterfully crafted using only the finest ingredients. 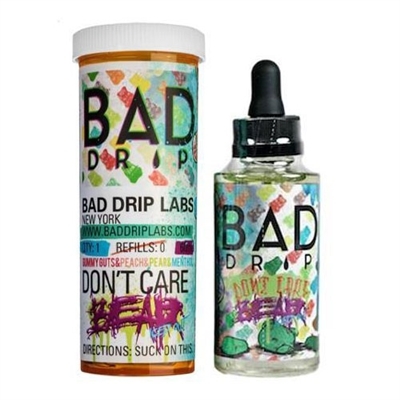 Don't Care Bear Iced Out is a yummy "MUST TRY" fruit candy e-juice! I like it a lot. Not crazy about it as the Farley Gnarly Sauce. Got a little old quick. A little dry for a sweet gummy flavor.